If you haven’t been to see the A+D (Architecture and Design) Museum exhibit Never Built: Los Angeles, it’s definitely worth a trip and the price of admission for anyone interested in the history of planning in the Los Angeles region. There are plans and visions of an alternative Los Angeles and L.A. region that many wish were real today. One example is the Olmsted Brother’s plan, “Parks, Playgrounds and Beaches for the Los Angeles Region,” laying out a network of regional parks and connected park corridors. The Metro Transportation Library has a complete scan of the lengthy 1930 document posted online. There are also visions presented we can be thankful never happened at all or were truncated by lack of funding and shifting political will. Santa Monica, who’s history and development is intrinsically linked to our greater metropolitan region of Los Angeles, makes a particular notable appearance in Never Built. 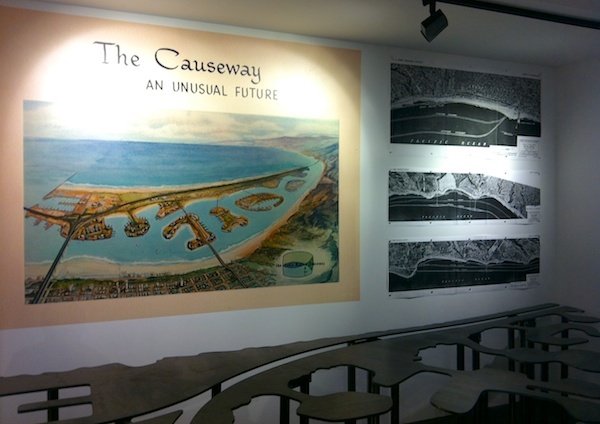 One of the most striking displays in the entire exhibit, and right near the door, is a display of the Santa Monica Causeway, a plan that started being hashed out in the early 60’s. There is a painting, unmistakably Santa Monica, but looming out in the bay sits a clustering of alien islands propping up a 200 ft. wide freeway connecting the 10 freeway to Malibu. Perhaps more than any other single proposal that never happened, the sight of the Santa Monica Causeway immediately drew responses at the gallery opening of relief, that this plan was only ever on paper (and a scale model that apparently vanished mysteriously). Such a grandiose alteration of one of the most popular stretches of California coastline views, with a suspended freeway zooming cars over the water, is pretty difficult to fathom now. There would have also been a related and second mass reconfiguration of land that was left unseen in all the renderings and diagrams of the causeway itself. To create the string of islands that would support the causeway and other planned harbor uses, rock and earth were to come out of massive grading and terracing in the Santa Monica mountains along with material already being ripped out for other Santa Monica mountain roadway projects underway or planned. This rock and earth removal would have simultaneously facilitated more prime mountain top property development. To move all the earth a grand conveyer belt was at one point proposed to carry rock and earth down and directly over a Pacific Coast highway, which already prone to rock slides, seemed an ominous disruption of it’s own. From the vantage point of today’s Santa Monica, with frequently stated values of striving toward greater environmental balance and protection of ecosystems, with popular local organizations devoted to coastal protection like Heal The Bay, that such a plan was ever seriously considered and promoted by local leaders, and diagrammed routes already prepared by the Arm Corps of Engineers, feels like a work of fiction. However in reading the background of this saga, the coalition that formed around fighting the causeway plan appears to have been a significant turning point toward environmental activism in Santa Monica, and also an early moment of the surfing community coming together as a political bloc joining others in defense of the Santa Monica Bay and its coastline. If you are interested in really digging into the back story of the Santa Monica Causeway, I cannot recommend highly enough the four part series on this written by Mark McGuigan for the Santa Monica Lookout news site in 2003. It gives a blow by blow of the players behind pushing the plan, the struggles over budgeting the monstrosity, and the coalition that formed against it and drive the last nails in. There is also a brief section on this plan in Santa Monica: A History On The Edge by Paula A. Scott in the embedded text above. Scott also outlines the role of the coalition that formed against the causeway in coming to the aid of preserving the Santa Monica Pier, once considered for removal as it fell into disrepair and had lost business to other regional recreation and entertainment centers. The causeway wasn’t the only failed offshore proposal with ambitions to develop directly in the Santa Monica Bay. 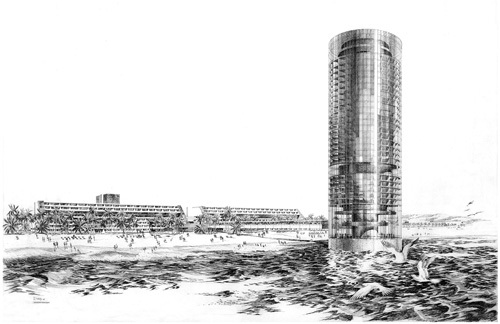 Also featured in the Neverbuilt exhibit was a development proposal from the developer John Moreheart, who had bought out the former Pacific Ocean Park pier, and commissioned an architectural plan for glass cylinder 600 room hotel with 360 degrees of continuous views of the ocean, coast, and city lights, that would literally rise straight out of the water. It was to be connected to land by a glass enclosed moving sidewalk over the waves, in what I could easily imagine appearing as some religious reenactment for every guest. The project tanked for lack of funding, and the developer, who was found to owe significant back taxes, lost the former pier property site as part of a swap the property was taken back into city control to become the open beach in front of Ocean Park Blvd today. That wasn’t the end of hearing about hotels at sea though. The former city manager Perry Scott promoted a bigger offshore hotel plan in the early 70’s, partnering with the Mutual Development Company, to create a “Santa Monica Island”. This island was to house restaurants, boating, fishing and other commercial enterprises topped off with a 1,500 room hotel. As if this Dubai style vision of the future (and long before Dubai began fashioning it’s own artificial island real estate) didn’t sound out there enough, apparently an earlier iteration of the idea that was rendered that was big enough for landing supersonic commercial jets, aircraft that were then a new concept that were about to begin service, but also never caught significantly. Oh, and a rail line to LAX through the bay off to the south end in the airport connected iteration. The Santa Monica Island concept initially had council support at the time, but the public was having none of it however, and many were now already organized around protection of the bay after confronting the offshore freeway. Apparently at one of the later public hearings of the Santa Monica island plan, a crowd of more than a thousand turned out, quite beyond anything I had ever seen or heard of for a development or project planing proposal, and council support of the idea quickly waffled. In the aftermath of all this came the formation of the California Coastal Commission, and a Santa Monica local initiative to require public votes for any significant development in the bay. The initiative passed with incredible public support, which along with terminating the contract of manager Perry Scott, ensured the public would never again be caught off guard by Hail Mary passes to try and develop at sea. Also among Santa Monica futures that could have been were connections to other parts of the region by one or more rapid transit lines or subways, that could have potentially been operating by now for sometime. 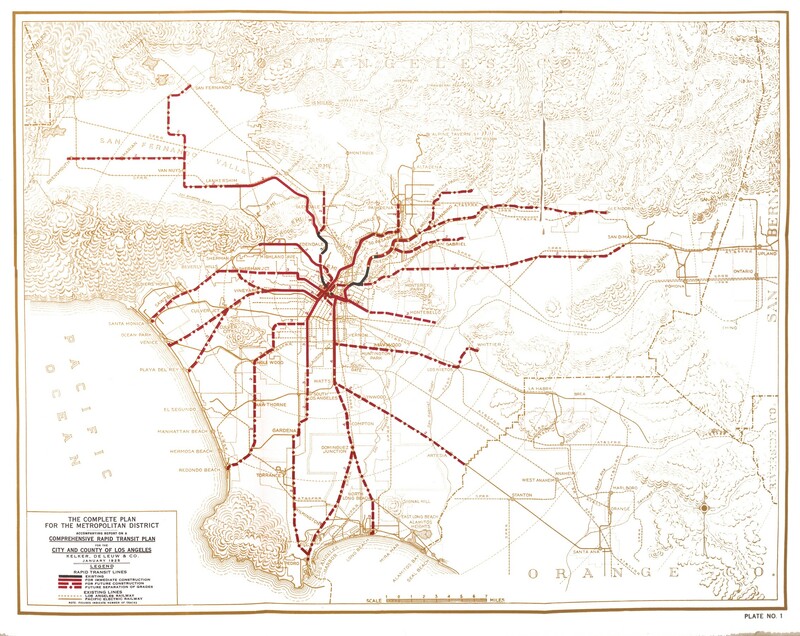 Of course there already were the Pacific Electric streetcar lines that had operated for so long and later abandoned after the car boom and freeways, but faster transit service along major routes were proposed going way back, and intended to be unimpeded by the congestion of cars through elevation or going underground. The Expo Line will be running in 2016, and who knows when the Purple Line Extension may get to Santa Monica (Measure R isn’t enough to get it all the way to coast), but proposals to bring rapid transit beyond the street car era to Santa Monica were being drawn as lines on maps as far back as 1925, and revisited over and over again for decades, rejected over and over, until finally a new rail era began in the 80’s after enduring years of choking traffic and thick smog. The Los Angeles region had instead come to be so often defined and shaped around it’s freeway grid, and the I-10 became the pipeline to the beach, but there were also many more possible freeway corridors than we have today. Some were proposed and planned but fell through under public frustration, political freeway backlashes or cost overruns. The Santa Monica Freeway left a serious scar and wide dividing line through Santa Monica’s Pico Neighborhood, but cutting up Santa Monica and it’s surroundings some more to create connections to a ‘Venice Freeway’ and ‘Beverly Hills Freeway’, were in the cards in the 1958 Freeways And Expressways master plan, along with many other slated freeways that were to trample elsewhere through the region, some that did get built, or partially, and some that did not. The history of how our metropolitan region actually built out is endlessly fascinating and pertinent to our present visions, hopes, and plans for the future, but so too are the glimpses of past possibilities and futures that were left untraveled. Some that could have been for the better, and some to our detriment. The many plans that failed, fell short, or were rejected outright, in the context of their time and place, have as much to say about our society as the plans and actions that were carried through to their conclusion. Thing’s certainly could’ve been much worse. The fact that north of San Pedro, we have 50+ miles of mostly undisturbed coastline — swim-able waters, lots of marine mammals, world-class beaches and waves — is pretty cool, considering that we also live in a metropolis of 13 million people.